The Donegal man takes on Dustin Poirier this Saturday night at UFC 195 at the MGM Grand in Las Vegas. IT’LL BE A case of better late than never for Joseph Duffy (14-1) and Dustin Poirier (18-4) this weekend when they finally square off at UFC 195. After their main-event bout at UFC Dublin was postponed back in October when Duffy sustained a concussion, the MGM Grand Garden Arena in Las Vegas will play host to their lightweight bout on Saturday night instead. “Obviously I’ve had twice as long to get ready for the same fight, so come fight day I’m going to be twice as ready. Training has gone very well. I feel like things have really clicked into place and I can feel the improvements everywhere in my game. “For some reason this fight wasn’t meant to be in Dublin, but I’m feeling great at the minute. I just can’t wait to finally get in there,” Duffy told The42 ahead of Saturday’s event, which will be headlined by a welterweight title bout between defending champion Robbie Lawler and challenger Carlos Condit. 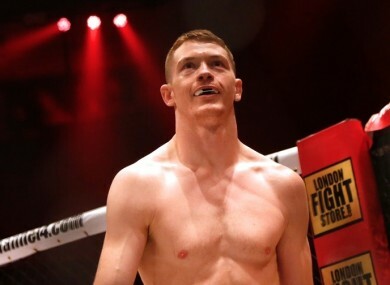 Duffy was originally due to have home advantage for his clash with Poirier, but the Donegal native is adamant that the change of venue will have no impact on the outcome. “Obviously it would have been amazing to have fought in front of a home crowd but in terms of any advantage, it really doesn’t matter,” said Duffy, who spent Christmas in Montreal where he’s now based, having become a member of the Tristar team this year. After his first-round KO defeat to Conor McGregor in September 2014, Poirier made the move up to the lightweight division and stopped Carlos Diego Ferreira and Yancy Medeiros. Having surrendered in his bid to claim the 145lbs title, Poirier is aiming to challenge for the belt in the 155lbs division instead. At 26, he may be a year younger than Duffy, but Poirier has had 13 fights in the UFC — stretching back to his January 2011 debut — compared to just two for Duffy, who debuted last March. If Poirier’s title aspirations are legitimate, he can ill-afford a defeat this weekend. When asked if there’s more pressure on Poirier going into the bout, Duffy said: “Yeah, without a doubt. I definitely feel that Dustin has got more riding on this. I’m still at the start of my UFC career and he’s obviously been around for a while. As for his own hopes of challenging for honours in the lightweight division, Duffy hopes that a win against Dustin Poirier on Saturday will be the next step on the road to a title shot before the end of 2016. “I suppose we all want to be champion,” Duffy said. “Touch wood, this fight goes well and it puts me up in the mix; maybe title contention or looking at the title itself. Who knows? Email “Duffy believes a UFC lightweight title shot is within reach in 2016”. Feedback on “Duffy believes a UFC lightweight title shot is within reach in 2016”.